Richburg, generally speaking, is considered much larger than the actual town itself. However, the town holds one honor above any other community in South Carolina the state’s longest-serving mayor. First elected mayor in 1967, John Boyd McCrorey won his 21st term as the mayor of Richburg in 2005. Due to Richburg’s close proximity to I-77, it is also considered the hub of recent and future growth and development in Chester County. Construction of a new shopping center with grocery store and the relocation of a large car dealership are two of many new additions to the immediate area. Fortune 500 corporations and other major industries have located to the Richburg area. Industrial, mixed-use and residential development is anticipated in the coming years. Richburg area students attend Lewisville Elementary, Middle and High School. The Lewisville School District has approximately 1,468 students and 90 teachers. All three facilities are new and designed to expand as future growth warrants. Chester County parents are very dedicated to assisting with school programs, sports and activities. The Richburg area offers a variety of housing choices. 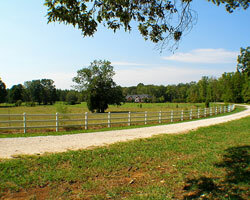 Most of the subdivisions are hidden from the SC 9 corridor and have custom built homes on large wooded lots. Large impressive custom homes are scattered throughout the Chester County countryside. Richburg’s close proximity to I-77 and SC 9 provides commuters great access to major transportation corridors in all four directions. Two smaller healthcare facilities are located with the Richburg area: Lewisville Medical Center on SC 901 and Lowry Medical Center on SC 9 near the Lewisville Elementary and High Schools. The Greater Richburg Association (GRA) was organized in 1991 by a group of local citizens. The organization’s mission is to support the orderly growth of the Richburg area utilizing various efforts to create an environment that is attractive and inviting to both families and industry. GRA is also devoted to the youth of Richburg and annually awards scholarships to three graduating seniors from Lewisville High School. Funds for these scholarships are raised at the association’s annual “Picnic in the Park” each May in the Richburg Park.